New Art West Midlands has opened its doors again to shine light on some of the stars of the region’s art colleges – with one of the exhibitions having a particular theme this year. 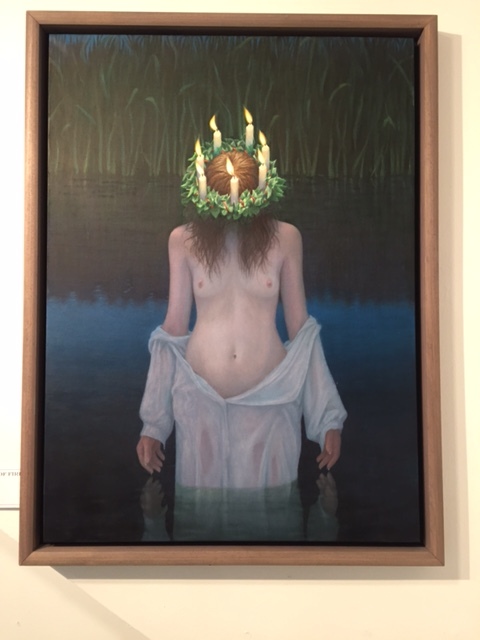 The exhibition is held across four venues and shows works by artists who have graduated from the region’s six art schools – Coventry University, Birmingham City University, University of Wolverhampton, University of Worcester, Staffordshire University and Hereford College of Arts – in the past four years. More than 180 people entered and just 31 were chosen to show their work across this year’s galleries: Birmingham Museum and Art Gallery, mac Birmingham, Worcester City Art Gallery & Museum, and Wolverhampton Art Gallery. NAWM was launched this year with a private view at mac, and it was soon clear there was a thematic choice to the works. The mac exhibition had been curated by Jessica Litherland who moved there from Rugby Art Gallery and Museum last year. She said she noticed a lot of artists were working with environmental themes, and she thought this would link in with the gallery being in a park, and wanting to get more involved in its setting. I could only find one Coventry University graduate showing at the mac, and she is Renata Juroszva, whose works explore the “relationship between femininity and domesticity” and are based on her photographs of domestic spaces filled with female models. Domestic Routine is a set of nine monochrome drawings showing women doing small tasks such as taking a bath or going upstairs, creating ideas of privacy and intrusion. Jade Hamilton (ex University of Wolverhampton) has combined (above) various found objects around the idea of a post-apocalyptic future where humans have used up the earth’s resources to such an extent they have created an environment where it’s virtually impossible to breath normally. 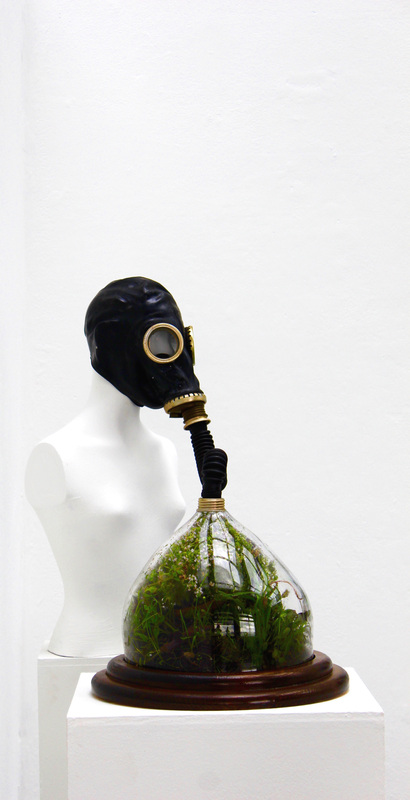 Mannequins wear gas masks attached to small ‘microcosm planted biomes’, glass domes full of greenery. They are impressive if sobering. Some of the other works on show at the mac are not easy to look at. Megan Evans (ex BCU), is showing Natural Collection, a selection of works made from pastel, and cosmetics, looking at people’s ideas of self presentation through deciding to change their appearance. There are some slightly gruesome images of faces cut open for facelifts, dental work and other facial surgery. They make their point about the ugliness and unpleasantness gone through in the search for beauty. Halina Dominska’s work is quite fun. It looked at first like a big pink canopy, with flesh picky bits hanging from it; it relates to the skin, to senses and reactions. Called Bound to, it is made of soft silicone, fishing wire and pressure sensors, with bits that start pulsing in a triffid-like manor if you stand close to them. Sarah Zacharek (ex University of Wolverhampton), is interested in travel, and also inspired by the work of Hamish Fulton. In Re:Discovery she traced a route determined by photographic negatives of her late father’s journey to Torun, his home town in Poland, although she had no first-hand memories of him and no connection to his heritage. She has combined his photographs with ones taken where he had stood, also photographing the street she stood on, together with sounds from the journeys. 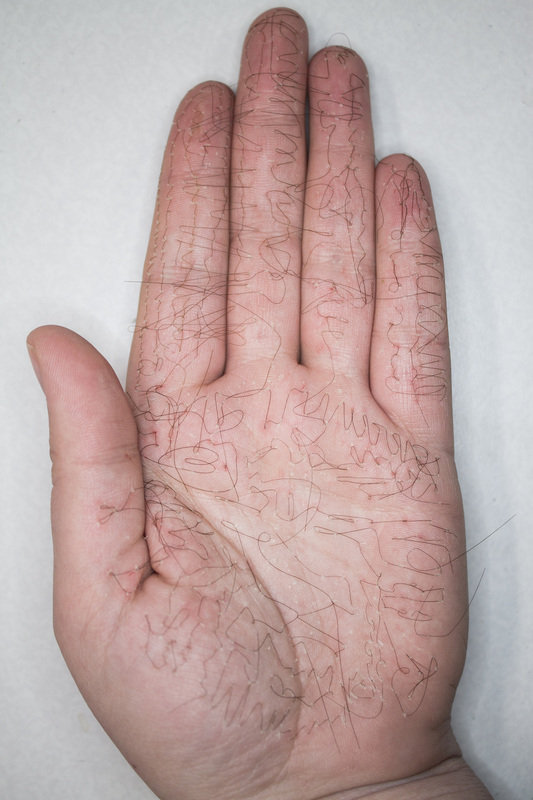 Natalie Ramus (ex Hereford College of Arts) has produced large photographs of hands that at a distance look as though they are painted with henna; but no, it’s a hand stitched lightly with human hairs. Hand Stitched is apparently about using shock to prompt the spectator to reconnect with their body. It’s certainly quick shocking. 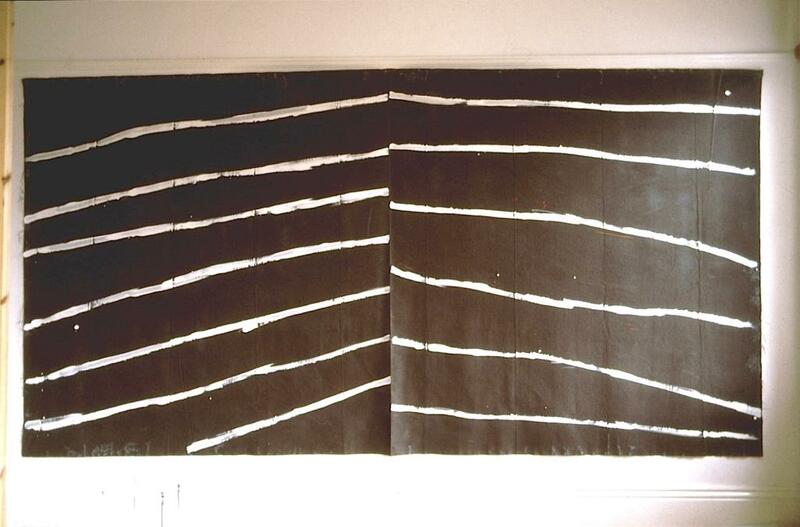 Jenna Naylor (ex Staffordshire University), has created some charcoal and marker pen drawings, one bravely on tracing paper reaching across the room and others on the wall, called Botanical Hybrids, which show her interest in classificatory systems and taxonomy, and “use the space between fact and fiction”. They look like a mix of under sea life and plants. All four exhibitions of NAWM are on until May 14. Looking at the exhibition catalogue other works I’d like to track down (both by Coventry University graduates) are some colourful mixed-media anti-capitalist, anti-austerity landscapes created by Coventry University graduate Daniel Smart, and Natalie Seymour’s digital photo collages of an empty college building in Smethwick which fuse images of the interior and exterior to create monumental images. Coventry-based artist David Howell could not be accused of rushing into having an exhibition, as it’s 23 years since his last one – however it has been worth the wait. 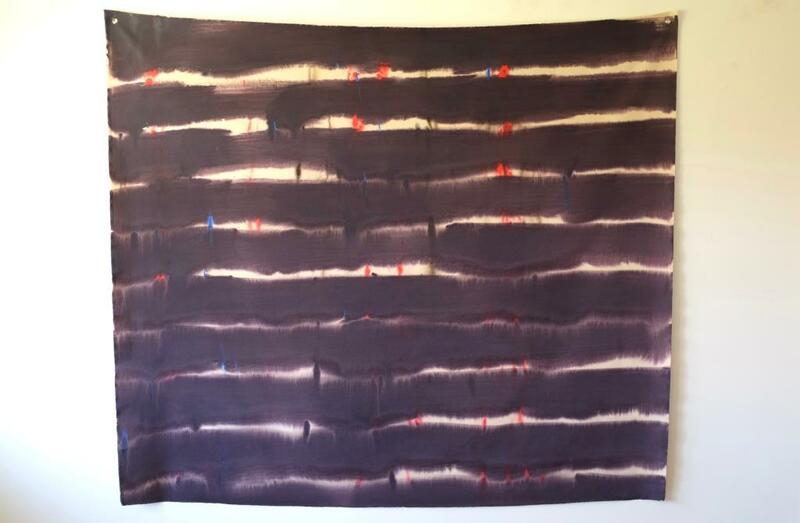 Black Mountain Red River captures David’s interest in investigating ideas of landscape. The large to very large colourful paintings work very well in the open white spaces of the Lewis Gallery at Rugby School. David’s colour use has changed over the years, with brighter hues now filling the canvas. 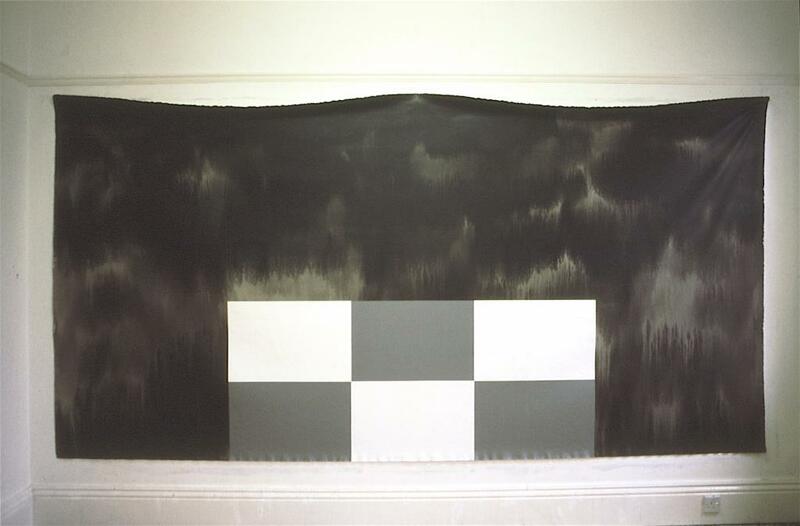 Mineral Memory from 1996 shows this, a large mainly dark green painting with a lozenge-shaped block in the middle. 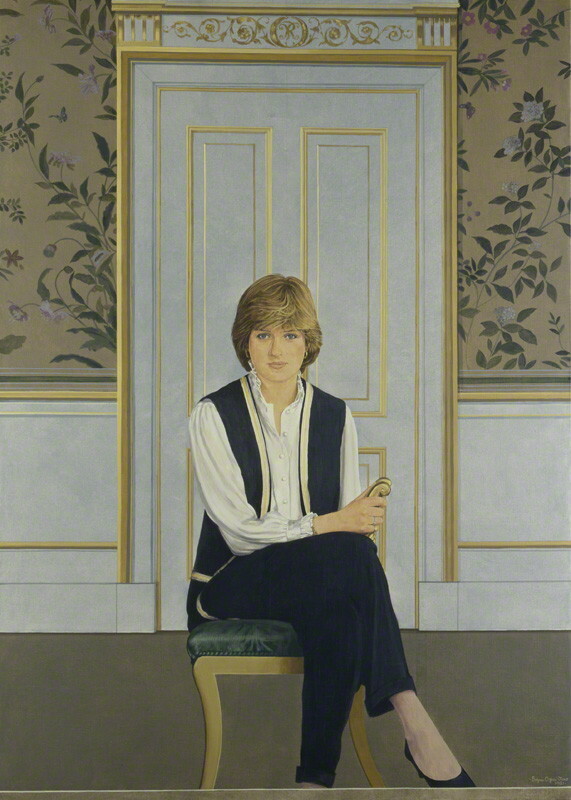 Other older works are also generally darker in colour. 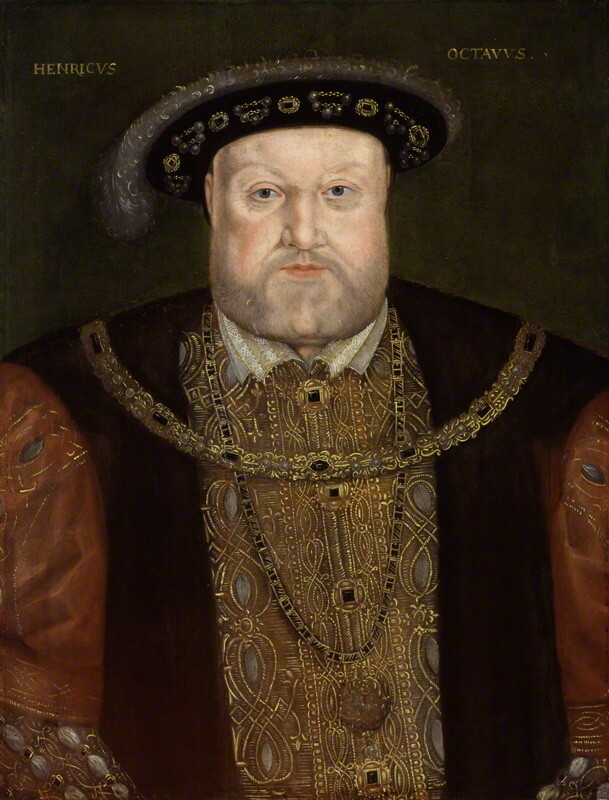 The painting style involves what looks like a confident application of the paint, generally in thick lines. Falling Water features green, blue, purple and orange paint streaming down the canvas to the bottom. Palimpest features a line across the canvas with brighter colours across the top. Some of the paintings have the look of lines of different strata in rocks or cliff faces. One work has a grey background with a blue river running through it, and Above the Shivver features yellows towards the base and thickly-applied broad swathes of coloured paint with more greys and purples up top. You can imagine fields, or vistas opening up, with various skies and weather conditions. David, who took a Fine Art degree at the then Lanchester Polyechnic in the 1980s and who was a prizewinner in John Moores 18 at the Walker Art Gallery in Liverpool in 1993, said his influences are broad, “ranging from a fascination with geology and deep time, the scientific understanding of the ongoing processes that have shaped and continue to shape the land around us.” Influences include maps, satellite images, historic paintings and mineral samples. It feels a lifetime ago since David’s works have been seen in public, and at the busy opening a lot of people were glad they had been brought out of his studio at the Canal Basin in Coventry. Don’t miss the chance to see them at the gallery, which is open Monday to Friday afternoons until March 2 (half term excepted). A Japanese-themed exhibition in Warwickshire takes a look at life in the country more than a century ago. It does though seem a bit confusing. Journey Through Japan is a touring exhibition on loan from Horniman Museum & Gardens in London, complemented with some work from Leamington Spa Art Gallery & Museum’s own collection, for the show at the gallery. 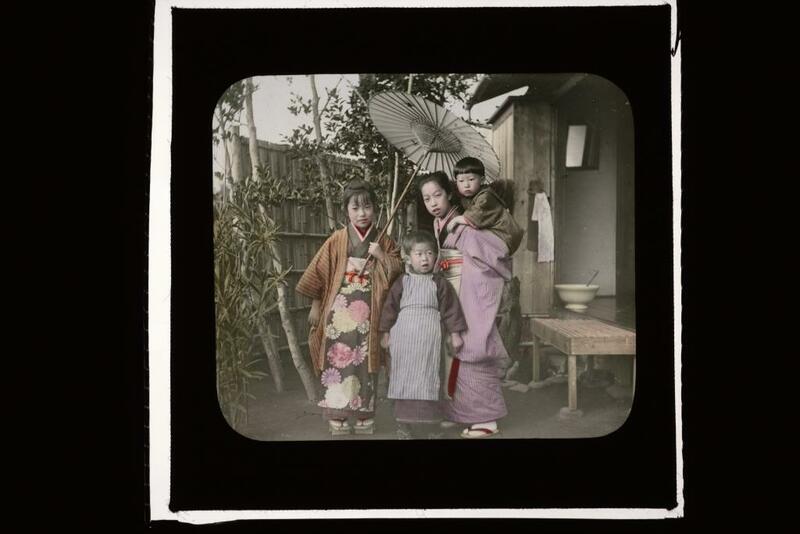 It is described in the press release as a selection of “intricate and beautiful lantern slide photographs taken in the early 1900s which allow you to experience the stunning landscape of Japan during that era”, taken by Marjorie Bell and her cousin Leslie, when they travelled around the country in 1903 for two months. They had left Marjorie’s home on a sheep station in Victoria, Australia, to travel with her mother Hester. The information in the gallery said Marjorie, who was only 13 at the time, had her photos processed in Japanese studios. She wrote a detailed diary, and the pictures in the exhibition have her interesting descriptive captions alongside them relating to the image. What causes confusion however is that some of the photos were clearly not taken by Marjorie and her cousin, which raises the question of whether any of them were, and why this isn’t specified. (See bottom and the helpful comment below). There is even one illustrating people in Japanese costume of the day in snow, when Marjorie wasn’t there. There is one attractive picture of a young family, the oldest child carrying a baby on her back, and Marjorie’s comment is that this was something they saw frequently amongst young children. Some other young children are featured and after Marjorie’s diary quote about children, there is a comment that she may not have seen children this poor which raises the issue that she couldn’t have taken that photo. She travelled to the popular island of Miyajima and there is a photograph of people at work, with hand-pulled carts, big straw hats to keep off the sun, and young children accompanying them. The famous entrance gate to the Itsu-kushima shrine, which appears to float on the water when the tide is in also featured. Some dancers in a hotel are shown, and there are a number of attractive countryside photographs; a huge lake, and some gushing waterfalls in very green and tree-filled countryside, a part of Japan not so often pictured. An avenue of enormously-high bamboo trees has a couple of people wandering down the middle to show the scale, and in Nara small deer wander around waiting to be fed, the same as today. In this image a brightly-coloured patch of orange leaves on a tree catches the eye. Nagoya Castle stands proud and attractive, five storeys high, and some streets capture people, shops (with huge signs outside showing what they sold) at this period. A photo of Tokyo is very different from today, with lots of low-level buildings and fields, but a sumo wrestling match looks similar. In Nikko, Marjorie’s diary commented that she wished she’d been able to see the attractive red bridge which had been washed away in high waters – so the picture of the red bridge intact was clearly taken by someone else. In one of the last ones, Mount Fuji is artistically reflected in a lake where there is a solitary fisherman. The confusion over how many or whether any of these photos are taken by the young Marjorie detracts from simply being able to enjoy these attractive moments from this period in the country’s history. The gallery has added some of its own Japanese-related items to the exhibition too. These include some dolls, an Oriental-building shaped box, and a Satsuma jar, with an attractive picture on top of a bird taking flight. 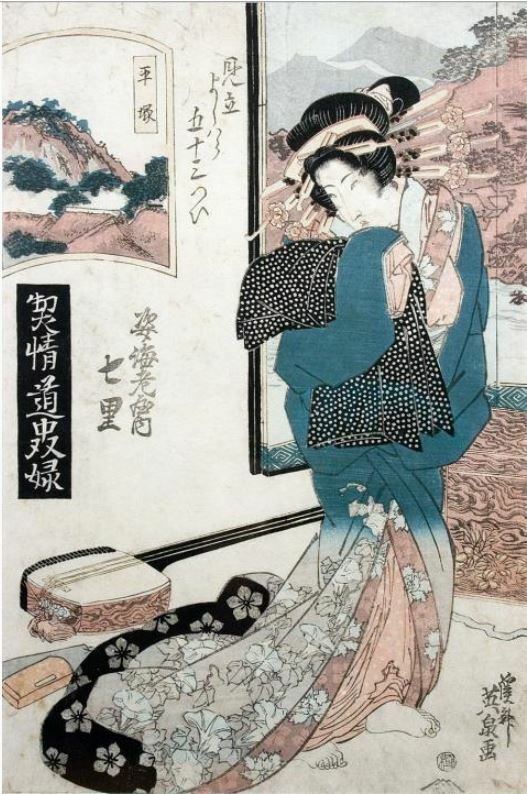 There are also a number of woodblock prints, including several by Kikugawa Eizan, on showing what is described as a tipsy girl dropping her drinking cup, and also a couple by Kitagawa Utamomo II depicting a high-class courtesan being escorted through a crowd by a servant and her apprentices. They are all worth seeing and it’s good they have been given a chance to come out of the stores. *It has since become clear none of the photographs were by Marjorie but from the Horniman Museum’s own collection of lantern slides, taken by Frederick Horniman himself. In the bleakness of January, Deasil gallery in Leamington is trying to cheer us all up with an exhibition called Begin with Beauty. It consists of work by a number of their regular artists, plus the back room is taken over for the first exhibition there held by Rachel Weston, who lives near Leamington. Her pastel works include Machir Storm, with dark skies heavy over some small white cottages, and a large sweep of beach, and Saligo Bay, a beach with dramatic sharp rocks, and a different cloudy sky. Other artists featured in the exhibition include Cult Zero, who had his own show last year. There are several large digital prints of his strange creatures, and some smaller animal-focused one. Spectrum by Caitlin Burton, Minds Eye by Sonia Bublaitis and Poseidon’s Kingdom by Nancy Upshall. Sonia Bublaitis is showing several brightly-coloured paint on Perspex pieces including Serendipity and Blue Waves, and Coventry-based Nancy Upshall has some of her familiar colourful abstract paintings such as Poseidon’s Kingdom, a look into an underwater world. Jenny Clark has several mixed media works featured, including The Joy of Farthingstone, an attractive if rather idealised-looking village, and Hakeshead, churches and houses on a hill. It’s a colourful, cheering exhibition to start the new year, and a good introduction to Rachel Weston’s work. The exhibition is on until January 26. 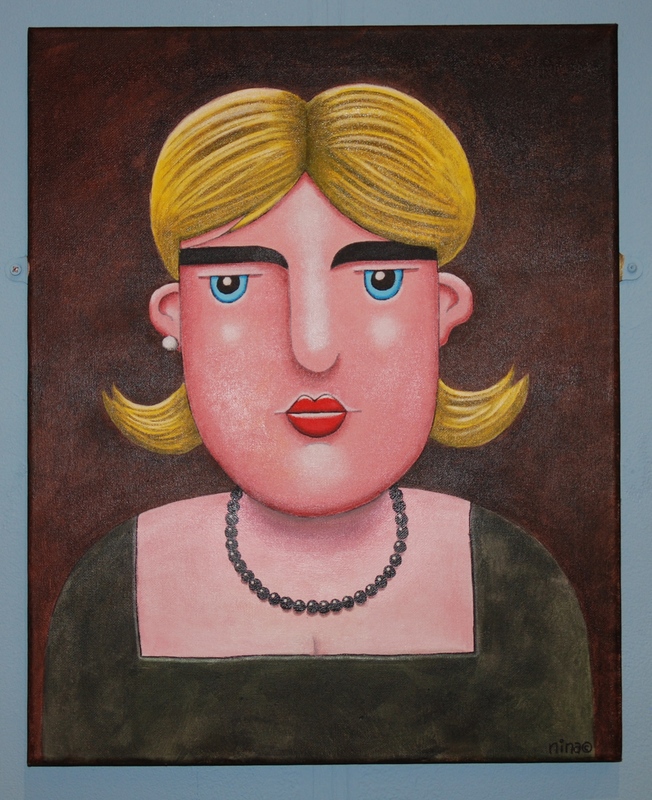 The Rugby Open exhibition is on again, showing an interesting diversity of works. Apparently 236 items were entered, and 97 have made it through to the exhibition, with a few artists showing two or three pieces. Paintings not surprisingly dominate, but there is a good variety of style and content, plus works in other mediums. Tony Baker’s We Are Sailing is one of the few photographs, and taken from an interesting angle, looking down at a selection of balconies on a cruise boat, and the people on them. Another photograph is Jean Sutton’s Patterns of Birmingham, showing swirly reflections in metal. Linda Cavan’s The Red Speck is strangely compelling, a small red speck on an inkpen drawing of what looks like some sort of bag or container. Lilly Martina Gardener, a former winner of the Rugby Open, has two works on show, Winter Snows over Weedon, showing people walking along in a snowy scene at her home village, and Blackbirds and Tea. Both are in her distinctive style, which appears to be influenced by Henri Rousseau, with every bit of the canvas covered in activity and colour, with dense fronds of greenery. Julie Bett’s Reflections is a landscape in mixed media, a bit Piper-esque. Nancy Upshall has two colourful abstract paintings in the show including The Bridge, a collection of small shaped colours creating a path across the canvas. Eric Gaskell is another familiar name at Rugby Opens, and he has three linocuts featured, including one which called Boxed Boundaries – a linocut slider game, which is unusual. Helena Godwins’s sculpture Cat & Mice is made out of a breeze block so has a strange, holey, texture to it. Roger Griffiths is also a known name from Rugby exhibitions, and his Rugby Cement from King’s Newnham watercolour shows a well-known Rugby site too, the huge building towering over colourful out-of-perspective landscapes. Val Hunt’s sculptures made from drink can metal are familiar and the one on show here is particularly charming, entitled “A conference of endangered birds discussing their future. Nightingale, lapwing, barn owl, cuckoo and house sparrow”, with the birds, looking very knowing, sitting on a branch together. I’ve seen Bryan B Kelly’s work in Leamington before and The Folly is in his usual exuberant style, with lots of colour, the paint applied in dots, and a regular pattern to the scene. Linda Keller has created Coventry Cathedral out of acrylic paint and mixed media, and Susan Moreton’s In the Footsteps of Monks is also a mixed media of what looks like a monastery or cloister. Helen McChesney’s three oil painted landscapes are very pleasant to view, with pale colours, entitled Summer, The Wheat Field and The Ploughed Field. Neil Moore, former Leamington Open winner, is exhibiting The Lightness of Darkness, an oil painting of a person lying down in his highly realistic style. Gérard Mermoz, a former winner of both Rugby and Coventry Opens, is showing Interior, two classic old paintings of women in domestic scenes becoming one by being placed on top of each other. Teresa Wells’s Hashtag Tragedy Take 2 is an unusual sculptural installation of several small naked models on the floor, some enacting a boat capsizing tragedy and others watching it or filming it. 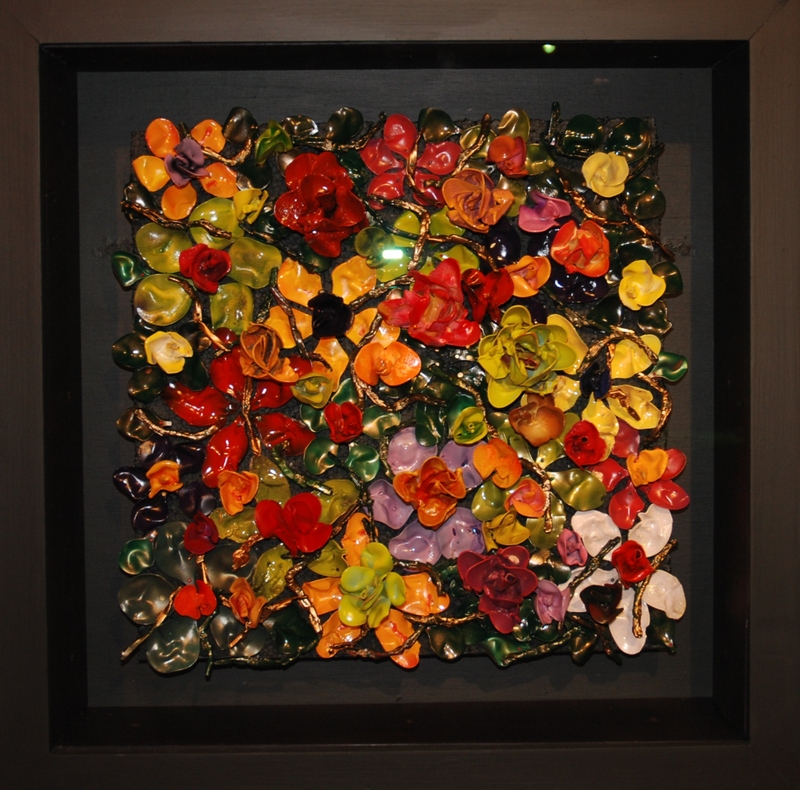 Graham Grimmett’s Tread Lightly, Walk True (Nature More) is a plastic resin creation, sticking out from the wall full of colourful bright flowers. It’s an interesting variety of work with something for all to enjoy, and is on until January 14. The exhibition winner was David Broadfield, for his charcoal work Lime, Newnham Paddox. David Kearney won the World Rugby award for his watercolour and pen and ink work Winter Trees, Val Hunt’s drink can metal sculpture mentioned above won the Rugby Decorative and Fine Art Society award and Roger Griffiths won the Brethertons LLP award for Newton Rugby.